Writer/director Karen Lam’s latest feature Evangeline is currently globetrotting the festival circuit, having made its North American debut on November 29th at the Blood in the Snow film festival in Toronto, Canada. 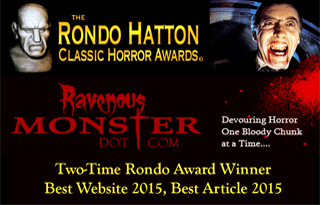 After chatting with Lam earlier this year just after Evangeline had wrapped, Ravenous Monster was eager to devour this movie. And that we have, Horror Fans. 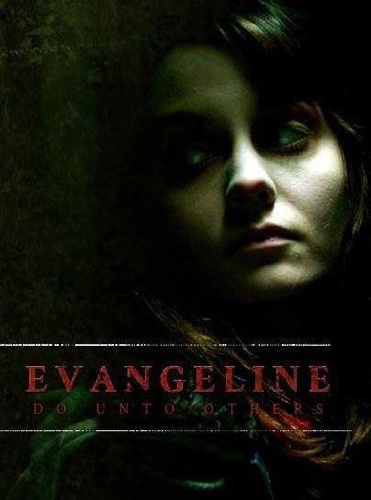 Evangeline stars Kat de Lieva as the titular character Eva, a meek and introverted young woman who leaves the confines of her pious Catholic home life to attend University, and to seek a fresh start having recently lost her younger sister to an illness. Soon after Eva arrives, her easy-going roommate Shannon (Mayumi Yoshida) decides to take Eva to a frat party where we (and Eva) will be introduced to Michael Konner (Richard Harmon), the King of the Frat Boys whose parties are requisite for social assimilation on campus. Eva ducks away to get ready for that night’s festivities and then, much like Clark Kent stepping out of a phone booth, she emerges from the Ladies Room looking like a goth wild-child to the shock of her friends and a somewhat jarring far cry from the mousy girl we’d just been introduced to. At the party, Eva—dancing seductively and looking dangerous—has little difficulty catching the attention of Michael, which has to be a good thing, right? But before anything resembling Cinderella can happen, she drinks herself sick and stays in bed much of the next day, too hung over for much else while most of her fellow college mates leave campus for a long weekend. When she does emerge from her saucy slumber, she and Michael run into each other and strike up a conversation which leads them to Michael’s father’s old hunting cabin located in the rural woods near campus. The cabin has been gifted to the fraternity by Michael’s father as a superficial way to make good with Michael—uh-oh, daddy issues! Soon after they arrive at the cabin, Michael inexplicably drugs Eva and then attacks her. When Eva wakes up in the woods, Michael and a couple of his cohorts allow her a head start in a deadly game of cat-and-mouse before they catch her, beat her, and leave her for dead. Eva’s soon discovered by a benevolent homeless war veteran and his friend, barely alive and irrevocably damaged. Eva no longer speaks and she suffers ostensible hallucinations wherein she’s trapped inside a concrete cell with a demon. After recovering physically from her near-death experience she begins hunting down her abusers and violently dispatching them. But she doesn’t stop there. Eva lures other predators into her realm as well, such as the serial killer Mr. K.—a character we’re introduced to early in the film but whose presence in the story is never revealed and seems unrelated to the main plot until Eva avenges his victims late in the movie. As Eva dispatches the University town’s unusually large collection of miscreants, she takes on the physical characteristics of the demonic entity from her concrete cell—an entity that, it turns out, is a forest demon that invaded Eva as she lay dying in the woods. The question the movie begs is this: Eva gets revenge, but at what cost? It’s a compelling question and the extent to which Evangeline articulates an answer is a bit of a subjective riddle. First and foremost, Evangeline is both a technical and an aesthetic thing of beauty. The movie’s photography is stunning. Cinematographer Michael Balfry lights the night exteriors in such a way that each shot is simultaneously atmospheric and bleak. From the mist-covered forests sliced through by the threatening beams of a car’s headlights to the dank urban alleyways, damp and shrouded in shadows, these locations’ dramatic features are brilliantly enhanced by Balfry’s keen camera work. Much of movie’s post-production work yields positive results too. The sound design is rock solid and the score fits nicely with Evangeline’s thematic motif and it seems appropriate to the demographic of the characters onscreen. 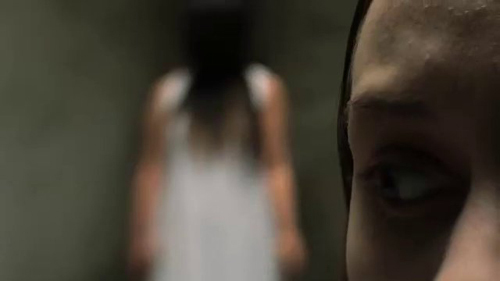 Lam and crew effectively use several editing devices that have been popularized by other successful 21st century horror movies, particularly those with an Asian bent, a la The Ring, wherein ghosts (or demons as it were) are depicted in a jittery, affected manor to maximize their creepiness. The most impressive element of Evangeline is the performance of its cast from top to bottom. The acting is consistently well done which is an impressive feat for a horror film of any budget, let alone one that’s as independently produced as this one is. Not only is the quality of acting a testament to the skills of the cast members, but it’s indicative of Lam’s skills as a director—one who coaxes both her desired performances as well as the vision she’s aiming for. This is an area where independent genre cinema often fails and Lam has wholly avoided that pitfall. Where Evangeline becomes sometimes difficult is in the storytelling department. Lam sets us up with a Judeo-Christian protagonist in a distinctly western locale, and then imposes a very classic Asian revenge-ghost scenario over the top of it as we watch a supernatural entity—a demon—violently rebalance the moral universe from within a purgatory-like spirit realm. This supernatural East-meets-West mash up is certainly high-concept and full of possibilities, but there are long stretches where Lam gives us too few explicit clues as to what’s happening which too often leaves us on the outside of the story looking in. Characters occasionally act in ways that are perplexing as the motivations behind their actions aren’t clear—not that these actions are antithetical to previously established behavior, but rather many of the key decisions characters make are left entirely unexplained. I want to know why Michael decides to kill Eva, a completely innocent woman whom he’s just met and seems to like. And why do his friends help him? And who is the serial murdering Mr. K. and why were his predations destined to be avenged by Eva? These expositional voids don’t seem accidental so their existence is confounding. I’m a fan of filmmakers that trust the audience to follow along even when doing so is difficult, but there’s a fine line. Evangeline vacillates along this demarcation between being compellingly challenging and frustratingly obscure, but when that line is encroached upon too often, what’s compelling becomes trying to unpack and explicate the story which is an activity that lies outside the narrative itself. When that task becomes untenable, frustration sets in, and the ability to follow along suffers. Even still, after watching Evangeline one can’t help but feel gratified by experiencing a plainly provocative, ambitious, and unique movie, warts and all. Karen Lam is an unapologetic risk taker whose work doesn’t pander as it clearly aims for something grander than typical genre fare. And risky storytelling is exciting, even when some of those risks don’t work as well as others. It seems that if she continues making movies, Lam’s got numerous more unique stories to tell. Moreover, Evangeline elicits a powerful emotional resonance. What’s both impressive and tragic is that while its impact is displaced by a lack of sign posts along the way letting us know what’s real and what’s not and why things are happening—which insulates us from empathizing with Eva to the extent she deserves—the final shot of Evangeline is profound in its implications and the emotional weight of the story persists. Had the movie’s tangents been more clearly tied together, Lam’s supernatural female revenge tale would be a revelation in this subgenre. As is, Evangeline is superior in many ways to thematically similar and well known films such as Last House on the Left and I spit on your Grave. So while it will leave some viewers wanting firmer narrative territory through which to tread, it’s a movie horror fans should see because it’s a movie horror fans will discuss and debate and that’s a good thing.